Our retail stores provide individuals with intellectual and physical disabilities the opportunity to learn specific, job related skills. When you walk into our South Sioux City store you will see our mission in action. Our goal is to prepare participants to eventually integrate into community employment. Participants learn all aspects of the job and what it takes to keep employment whether at Goodwill or in the community. Over the years we have had several individuals train within our stores with an end goal of employment and self sufficiency. 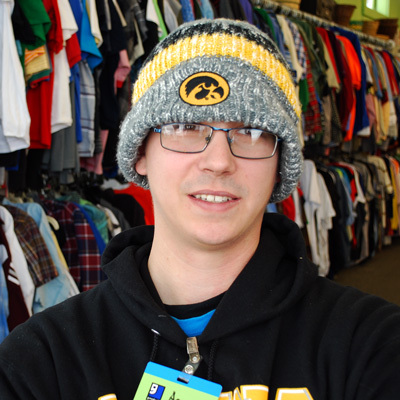 After successfully completing Goodwill’s habilitation programming, Aaron got the courage he needed to move out on his own and take control of his future. The next stepping stone of moving to competitive employment in the community was Pre-Vocational Training at Goodwill. clock,” said Aaron. Over the course of 9 years, Aaron has received the training and support needed to become self sufficient. Aaron now lives on his own, is learning all aspects of a retail job and aspires to become a store manager one day. It is through donations and shopping in our retail stores that Goodwill funds the programs that help individuals gain community employment. Please consider a donation by visiting our website: www.goodwillgreatplains.org.